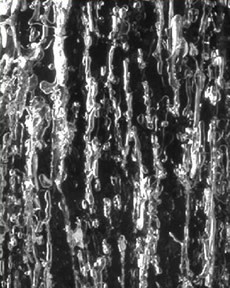 the physical process by which a vapor becomes a liquid or solid; the opposite of evaporation; in meteorological usage, this term is applied only to transformation from vapor to liquid; any process in which a solid forms directly from its vapor is termed sublimation, as is the reverse process. the transport of energy entirely resulting from the random motions of individual molecules, and not from any concerted group movement; occurs in response to temperature gradients; contrasts with convection, in which energy is transported by molecules moving together in coherent groups. an advanced form of new ice that forms as a stable sheet with a smooth bottom surface. a distinct soil micromorphology, resulting from the effects of freezing and thawing processes, in which coarser soil particles form compound arrangements. pack ice in which the floes are frozen together; ice cover 10/10ths. special design and construction procedures required when engineering works are undertaken in permafrost areas. snow metamorphism that adds molecules to sharpen the comers and edges of an ice crystal. geographic area in which permafrost occurs everywhere beneath the exposed land surface with the exception of widely scattered sites, such as newly deposited unconsolidated sediments that have just been exposed to the freezing climate; mean annual soil surface temperatures are typically below -5 degrees Celsius (23 degrees Fahrenheit). the major subdivision of a permafrost region in which permafrost occurs everywhere beneath the exposed land surface with the exception of widely scattered sites. the transport of energy resulting from the concerted movement of molecules in coherent groups; contrasts with conduction in which energy is transported by the random motions of molecules; atmospheric convection is nearly always turbulent and results in the vertical transport and mixing of atmospheric properties. cumuliform cloud which forms in the atmosphere as a result of convection; such clouds are also called clouds of vertical development, a cloud that has its base in the low height range but extends upward into the middle or high altitudes. a way that snow or ice can move by deforming its internal structure. the slow deformation (or time-dependent shear strain) that results from long-term application of a stress too small to produce failure in the frozen material. 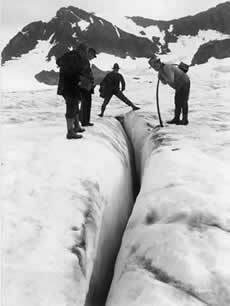 open fissure in the glacier surface. a kind of hoarfrost; ice crystals that develop by sublimation in glacial crevasses and in other cavities with cooled space and calm, still conditions under which water vapor can accumulate; physical origin is similar to depth hoar. a hard snow surface lying upon a softer layer; crust may be formed by sun, rain or wind, and is described as breakable crust or unbreakable crust, depending upon whether it wil break under the weight of a turning skier. the cryostructure of a frozen deposit of angular blocks that are coated with ice, whereas large spaces between the blocks are not filled with ice. A deposit of dust and soot, often bound by microbial mats, that is formed on melting glaciers and ice sheets. The deposits are often found in pothole-like pockets on the ice surface.